Our Avondale Estates and North Georgia commercial junk removal and recycling division works with property management companies, retailers, public storage companies, contractors, realtors, retail commercial landlords, business owners, Attorneys, and Fortune 500 companies to assist them in getting rid of their office and warehouse junk. We do complete office and warehouse cleanouts from A to Z. We remove general business trash and debris, cardboard boxes, pallets and shipping crates, office furniture, shipping supplies and equipment, industrial machines, shelving units, 55 gallon drums, manufacturing equipment and machinery, office paper and documents, appliances, all electronics, storage unit contents, workstation cubicle panels, business machines, computers, copy machines, and MUCH MORE. Basically anything non-hazardous! 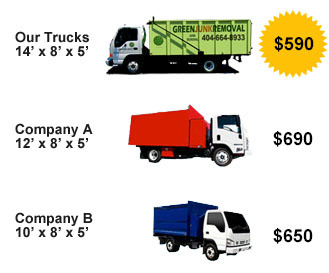 Since most commercial junk removal jobs involve recyclable items this will translate into a lower estimate for your company. However, in some cases additional recycling fees will apply for items such as computer monitors, televisions, and tires. You should be careful about doing business with companies that do not charge these recycling fees. In most cases this means that your items are taken to a landfill and not properly recycled and disposed of.